The keyboard includes a touchpad DPI adjustable functions and built-in high sensitive smart touchpad with 360-degree flip design. This new Rii X8 has some new features than Rii mini i8+ Multifunction: Wireless Keyboard + Multi Touchpad Mouse + Scroll Wheel + Multimedia control keys and PC gaming control keys+8-Color RGB Backlit. 8-Color RGB Backlit you can press "Fn+Win" key to change backlit color. Ultra sensitive touchpad with 360-degree flip design. With rechargeable polymer Lithium-ion battery. USB Dongle/Receiver inside of the back cover - no driver needed.Just Plug and Play. Auto sleep and wake-up function of the keyboard.When there is no any operation in 3 minutes,it will into sleep automatically.Press any button to wake it up. Transmission mode:GFSK 2,4GHz wireless,up to 10 meters. The USB Receiver (dongle) is inside the keyboard as the picture shows. Your device need an USB port in order to operate with the mini keyboard. 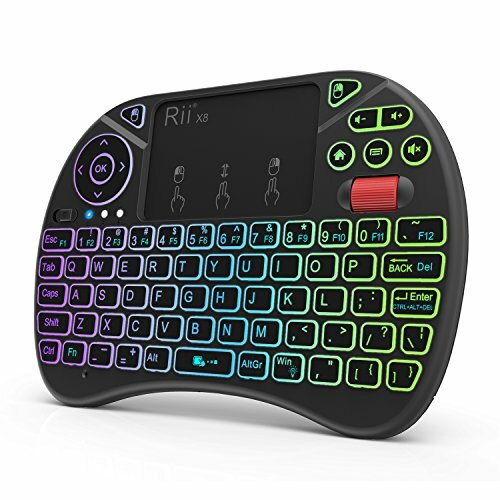 Rii X8 2.4GHz Mini Wireless QWERTY keyboard with Touchpad mouse Combo,8-Color RGB Backlit LED with USB interface adapter. New features than i8+:8-Color RGB Backlit,Multi-media buttons,Direction keys ,Power switch,Left and Right Buttons,Scroll wheel. This Touchpad supports multi-finger functions,A single finger click as left mouse click, two-finger click as the right mouse click, double finger drag as the rolling screen,Single finger functions as sliding pointer. Auto sleep and wake-up mode,without operation 3 minutes,the keyboard will enter sleep mode.In sleep status,all LED indicators are off.Pressing any key can wake it up.